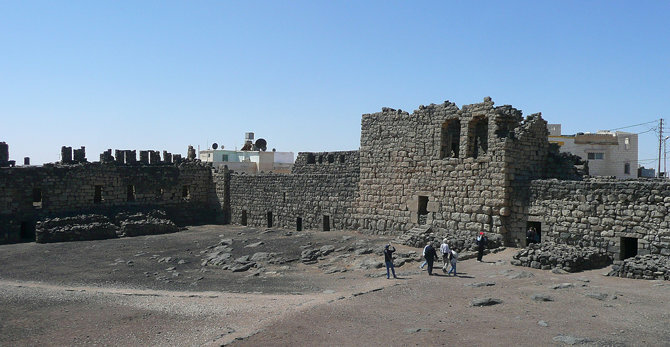 Qasr Azraq (Arabic: قصر الأزرق‎, "Blue Fortress") is a large fortress located in present-day eastern Jordan. It is one of the desert castles, located on the outskirts of present-day Azraq, roughly 100 km (62 miles) east of Amman. Its strategic value came from the nearby oasis, the only water source in a vast desert region. The name of the fortress and associated town came from these. The ancient Romans were the first to make military use of this site, and later an early mosque was built in the middle. It did not assume its present form until an extensive renovation and expansion by the Mamelukes in the 13th century, using locally quarried basalt which makes the castle darker than most other buildings in the area. The castle is constructed of the local black basalt and is a square structure with 80 metre long walls encircling a large central courtyard. In the middle of the courtyard is a small mosque that may date from Ummayyad times. At each corner of the outer wall, there is an oblong tower. The main entrance is composed of a single massive hinged slab of granite, which leads to a vestibule where one can see carved into the pavement the remains of a Roman board game. Although very heavy — 1 ton for each of the leaves of the main gate, 3 tons for single the other — these stone doors can quite easily be moved, thanks to palm tree oil. The unusual choice of stone can be explained by the fact that there is no close source of wood, apart from palm tree wood, which is very soft and unsuitable for building. The strategic significance of the castle is that it lies in the middle of the Azraq oasis, the only permanent source of fresh water in approximately 12,000 square kilometres (4,600 sq mi) of desert. Several civilizations are known to have occupied the site for its strategic value in this remote and arid desert area. The area was originally inhabited by the Nabataean people and around 300 BCE fell under the control of the Romans during the reign of Diocletian. 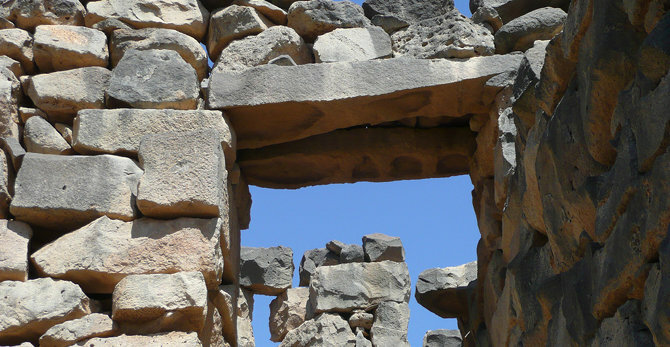 The Romans built a stone structure using the local basalt stone that formed a basis for later constructions on the site, a structure that is also believed to been used by the Byzantine and Ummayyad empires. Qasr al-Azraq underwent its final major stage of building in 1237 CE, when the Mamelukes redesigned and fortified it. The fortress in its present form dates to this period. In the 16th century the Ottoman Turks stationed a garrison there, and T. E. Lawrence (Lawrence of Arabia) made the fortress his desert headquarters during the winter of 1917, during the Great Arab Revolt against the Ottoman Empire. His office was in the chamber above the entrance gatehouse. It had an additional advantage in modern warfare: the flat nearby desert was an ideal place to build an airfield. 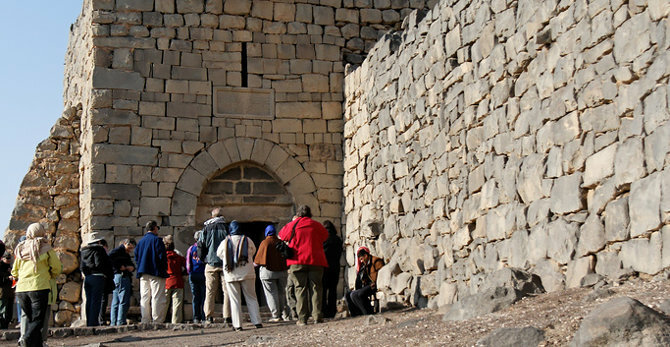 Qasr Azraq is often included on day trips from Amman to the desert castles, along with Qasr Kharana and Qasr Amra, both east of the capital and reached via Highway 40. Admission is JD 2. Visitors can explore most of the castle, both upstairs and downstairs, except for some sections closed off while the rock is shored up. There is little interpretive material at the moment.